The Kit takes up the meat of the installation, but it’s the additions to Beat Agent that most impress with Groove Agent 5. New Kits and Styles are good. The Kit is held back by Acoustic Agent. 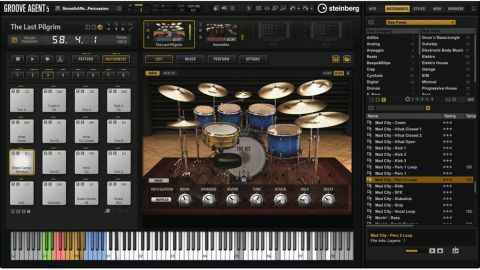 With Groove Agent 4 marking a total and very welcome redesign of Steinberg’s previously-anachronistic ‘virtual drummer’ plugin, version 5 could in fact reasonably be considered a second generation release. Resplendent in a freshly darkened colour scheme, the Groove Agent 5 (VST/AU/AAX/standalone) interface is compatible with Retina and HiDPI displays, and freely resizable by dragging its edges or bottom right-hand corner. Clicking the little button to the right of the Show Keyboard button pops the new Browser out to the right. This aggregates the Kit, Instrument, Style and MIDI Load browsers in a single panel, detachable from the main UI, should you wish. Groove Agent 5 doesn’t add to the existing Acoustic, Percussion and Beat Agents - dedicated engines for acoustic drums and percussion, and electronic sounds, respectively - but it does throw in a ton of new content for the first and last. Simply named The Kit, the new addition to Acoustic Agent is a 14GB massively multisampled drum kit, comprising Pearl Masters kick and Free Floating Brass snare drums, four Yamaha Maple Custom toms (8", 10", 12", 14") and an array of cymbals by Zildjian, Istanbul and Paiste, all recorded via a roster of top-notch mics at Teldex Studios in Berlin. With 47 articulations (wood and felt kick drum beaters, open and damped snare, shank and tip hi-hats, etc), up to 20 velocity layers per articulation, and five round robins, it’s a strikingly expressive and realistic kit with a big, modern sound. It also brings with it 20 new Styles, covering a range of genres from funk and reggae to folk and rock. The all-new integrated Sample Recorder enables internal and external audio signals - microphone inputs, hardware synths and drum machines, other virtual instruments in the host DAW, etc - to be directly captured to Groove Agent 5’s pads. The Sample Recorder appears as a tab in Beat Agent’s Instrument Edit page. Recording can be started and stopped manually or when the incoming signal exceeds and/or drops below specified volume threshold (with optional Pre/Post periods and automatic trimming); and other plugins and audio tracks are routed directly into Groove Agent 5 via the sidechain input. Various methods of auto-mapping sequentially recorded samples are provided (all to one pad, chromatically, black or white notes only, etc), and the ability to start and stop recording via MIDI makes it easy to slice loops across contiguous pads using an appropriately configured MIDI clip, for example. The Sample Recorder Options page enables selection of bit depth, file format (WAV or AIFF), sample storage location, and even a variety of file naming schemes. It all adds up to a tightly conceived and intuitive system for quickly flying anything you like into your Groove Agent kits in real time. As good as The Kit is on its own terms, though, it’s hardly a gamechanger within the overall GA context, as the majority of users will be satisfied with the incumbent (albeit much smaller) Rock, Studio and Vintage Acoustic Agents, and those seeking a versatile high-end drum kit instrument would clearly be better served by the far more expansive likes of Toontrack Superior Drummer 3 or FXpansion BFD3. Acoustic Agent still offers very little in the way of editing and control, either - you can’t even mix and match pieces from different kits or import Beat Agent samples, for example. 31 new Kits (samples and MIDI patterns) for electro, trap, house, garage and other electronic genres by Joe Ford, Billain, zKlang et al have been added to Beat Agent’s arsenal, taking the full GA5 footprint up to 31GB. These feel more valuable than The Kit, giving dance music producers plenty of quality material to chew on. You can also now use Acoustic and Percussion Agent Styles with Beat Agent, incidentally. For our money, Groove Agent 5’s most interesting new feature is the Decompose system, which is also housed in Beat Agent. This separates the ‘Tonal’ (ie, pitched - the body of a snare drum, say) and ‘Noise’ (ie, unpitched - the snare wires) components of a sample and saves them out as two new samples for independent levelling, processing and recombination, mixing with other disparate sounds, or anything else you can think of. The Prelisten function lets you hear the components before committing to them, while the Sensitivity, Duration and Cutoff controls determine which partials are considered Tonal and which are Noise. Decompose proves to be a highly effective corrective and sound design tool, endlessly useful for everything from corrective shaping (turning down those snare wires, say) to the conjuration of original hybrid sounds. Numerous ‘lesser’ tweaks and enhancements are sure to bring a smile to the face of the upgrading GA user, too. These include 32 velocity layers per pad (up from eight), 32 audio outputs (up from 16), drag and drop of samples to pads, viewing of waveforms in the envelope editors, sample hotswapping in the browser, soloing of sample layers, an improved pitch envelope, Prelisten for auditioning sounds and patterns, mixer export to Cubase 10, and an Auto Complexity mode. All good stuff. While The Kit is nice to have, Beat Agent is very much the focal point of this particular update - if not Groove Agent as a whole, truth be told. That’s fine, though: Steinberg’s percussive workstation isn’t ever going to compete with Superior Drummer and BFD in terms of depth and adaptability when it comes to ‘live’ drums, so it absolutely makes sense to capitalise on the software’s obvious strengths. The big draws here, then, are the new Beat Agent Kits, Decompose, the Sample Recorder, the resizable UI, and the myriad workflow improvements that come together to make this already fantastic instrument even better. It also continues to represent great value for money for newcomers, although the £85 upgrade from Groove Agent 4 is steep.